Created exclusively for Harrods, this fragrance blends notes of nutmeg, black tea, saffron and violet, with a dark sensual base of sandalwood, amber, labdanum and agarwood. Additional notes include patchouli, sued (suede?) accord and musk. Bond no. 9 Harrods Agarwood is available in 50 (£275) and 100 (£375) ml Eau de Parfum. Not another oud! Did they think they could fool us by using a synonym? Ah yes, forgot that one! I wonder if this will smell very much different than Bond’s NY Oud, which I enjoy smelling from afar but is one of the most potent, medicinal ouds I’ve smelled. I have a sample in its wrapper in my desk drawer and can sometimes smell the Oud wafting my way. Honestly don’t know, and I guess you’d have to compare it to the Harrods Oud Patchouli too. According to the official Bond No. 9 UK facebook page, this one will be an entirely new fragrance. 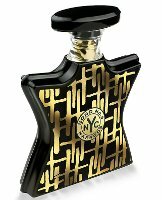 Since I really like both Harrods Oud and New York Oud (which are two very different takes on Oud) I look forward trying this, even though I still haven’t got a chance to try the Oud Patchouli one. I look forward to trying this. New York Oud is insanely strong and medicinal.. but Oud Patchouli is something extremely special – more of Absinthe Oud Patchouli and not an Oud in your face bomb. I know we are all Oud’ed out.. but this one could be interesting. Interesting how many comments there are on Basenotes identifying Bond no. 9 as the worst of the niche lines. I have yet to smell any of them, but I would like to. Despite their enormous output, I’m sure some of them are terrific. Maybe the criticism is based on value, and the Bonds are expensive. Yes they are, and perfume enthusiasts tend to be well-informed and canny folk who look for value for their perfume dollars and are suspicious of a house with such a large output and strong emphasis on bottle design. Bottles are 100 ml and 50 ml as standard. There are purse sprays, but they are sold in expensive sets. And then there was a fuss a few years ago about The Perfumed Court selling samples. My impression is that Bond is not especially interested in the hard-core perfume enthusiast market, which of course is very small, and perfumista/oes can sense that, and tend to be hostile. I’m in Australia and Bond is not sold where I live. I’ve just noticed that Bondno9.com charges a cool $150 flat rate for international shipping. I just wanted to add to this that there was lots of grumbling when the owner of Bond threatened to sue a very small artisan perfumeur for using a very general word (can’t remember what it was) that Bond had already used for one of their perfumes. They claimed ‘copyright infringement’, or something and had mega bucks behind them to intimidate her with. So there was lots of negative publicity about that, especially within the perfumista world which treasures the lone artisan. The criticism is based on both value and artistry: Bonds are made of common aromachemicals and are priced higher than their quality merits, and many of their scents are highly derivative of other successful perfumes on the market. Honestly neither of these two factors would keep me from buying a Bond if I found one I really loved; there are several that are quite nice.